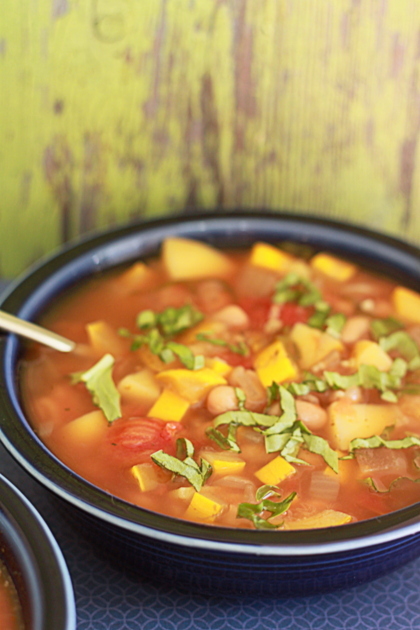 Hearty but not heavy, this vegetarian tomato-based soup features cannelloni beans, delicious seasonal summer squash, smoked paprika, and fresh basil. Add andouille sausage at the end of the cooking process and everyone in the family - meat-eaters and vegetarians alike - will slurp this soup happily. I’m in love with my Crock Pot. A little obsessed even. I talk about it often … which is what a girl with a crush tends to do, right? Seriously … Crock Pots are completely awesome though, am I right? Throw it in, walk away, come home to a completely cooked (and no doubt delicious) meal. If loving my Crock Pot is wrong … oh hell, I know it’s not wrong, so I’m not even going to finish that sentence. This soup is one of the reasons our slow cooker has been out on the counter more often than not this past couple of months. Even though it’s been pretty warm weather-wise, I’ve still whipped up this soup a good half a dozen times every time even a wisp of clouds swoop in and the temperature dips below 70. Why? Partially because I was trying to perfect the recipe, but also because I couldn’t resist those vibrant yellow summer squash every time I stopped by my local farmstand, and I had to do something with them other than grill them. And also, it’s really, really good. 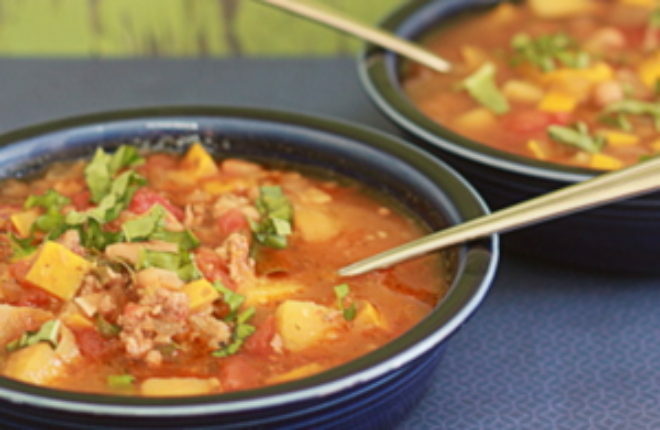 This soup is reminiscent of minestrone … heck, it probably even qualifies as minestrone, except I have another recipe that I love that I like to call minestrone, so this one is Slow Cooker White Bean & Summer Squash Soup. 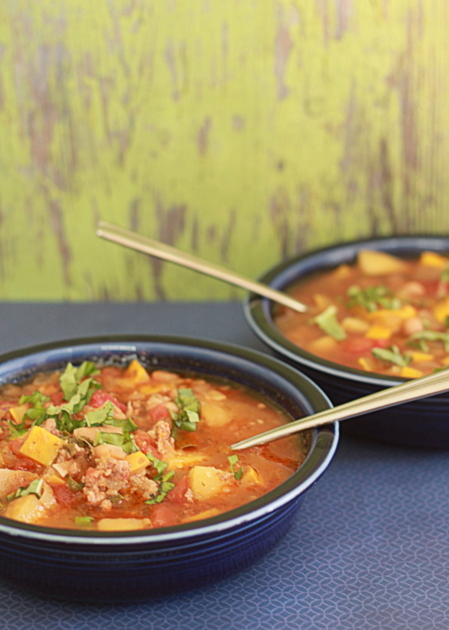 Slow Cooker White Bean & Summer Squash Soup with Optional Andouille Sausage, to be exact. 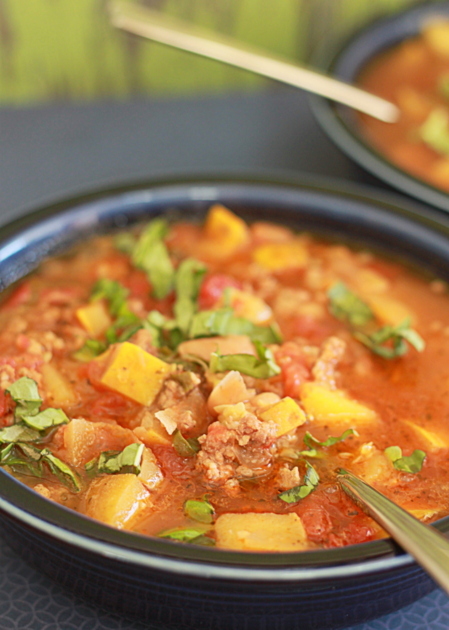 Because if your resident carnivore is anything like mine, said meat-eater will naturally appreciate the addition of smoky sausage to this otherwise-vegetarian soup. Me, I’m good with the vegetarian version. Really good. It’s hearty, but not heavy. White beans, summer squash, and diced potatoes give it heft, while smoked paprika gives it a slightly mysterious smoky note. The fresh basil, torn in at the very end, reminds you that even though fall is near, it’s still officially summer. So when you add the sausage for the meat-eaters, it’s the cherry on top. [box type=”info”] We buy our Andouille sausage already made, from Whole Foods (the habanero sausage is also pretty amazing, according to my resident carnivore). If you’d like to try making the Andouille sausage on your own, this recipe on All Recipes looks like a great start. Add the beans, tomatoes, squash, potato, onion, garlic, Italian seasoning, smoked paprika, 1/2 teaspoon salt, a quick grind or two of black pepper (or a hefty pinch), water, and the Parmesan rind to the Crock Pot. Stir. Remove the Andouille sausage from the casing and brown in a medium saucepan. Using a spoon, remove grease from the pan. Add a little less than half of the soup - about 3 1/2 cups - to the saucepan with the sausage. Stir and, over medium heat, bring to a low boil. Simmer for 20 minutes. Tear basil leaves over both batches and stir. Serve with additional basil leaves and shredded Parmesan cheese, if desired. 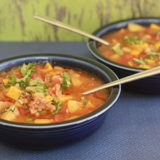 saw this recipe this morning and it looks delicious – i have a summer cold (booo) and soup would be great right about now – am going to have to modify a bit due to no squash (i have green beans to throw in) – and i’ll hunt through the fridge to see if there’s a bit of meat to toss in later – or not :-). I’m doing it on the stovetop, which i think won’t be a problem, just a much shorter cooking time – thanks for the “italian penicillin” 🙂 it already smells divine; can’t wait till it’s done. I just made this tonight, and I loved it! I subbed half a butternut squash for the potato because it’s what I had left over, and it worked out great. It had beautiful shades of color: red, orange, yellow, white, with a garnish of green. It looked like Autumn in a bowl.